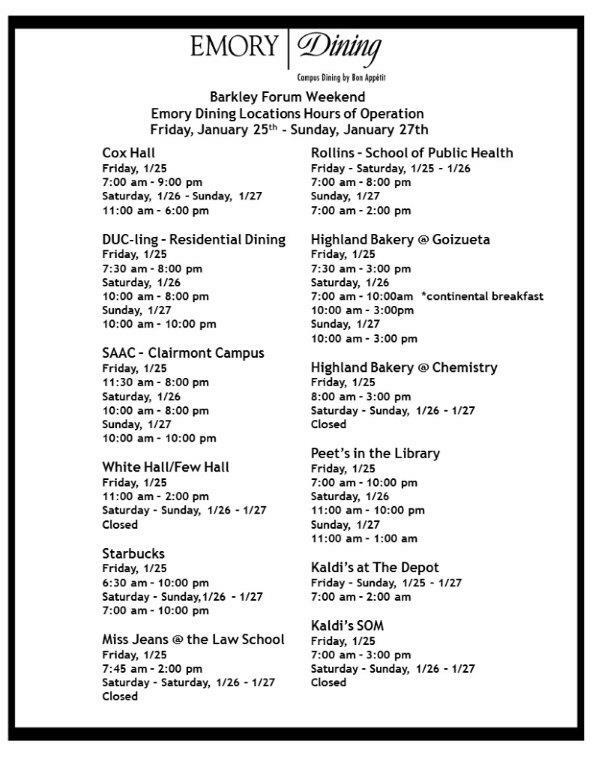 It is our pleasure to welcome the member schools of the Barkley Forum for High Schools to the 64th Annual Barkley Forum for High Schools at Emory University in Atlanta, which will be held January 25, 26, and 27, 2019. It is an equal pleasure to invite applications from other schools to be with us in January. Emory University has a historic commitment to forensics, both high school and college. We look forward to seeing the member schools, and we anticipate invitations (which follow applications) for the interested schools of the United States with superior debate and forensic students. · To stay true to the founding principle of the Barkley Forum for High Schools – to encourage the development of high-quality forensics programs at high schools around the country – this year the tournament will only accept applications from students representing their high schools. No independent entries will be allowed, and no entries representing entities other than high schools will be allowed. Please make sure your bookkeeper sends any checks to the updated address. Our physical office location remains the same but has a new physical address: Alumni Memorial University Center, 630 Means Drive, Suite 135. · The Emory campus is still undergoing major construction. As a result of the room shortages the construction in the center of campus is causing, at least until December 7th when admittance decisions are made or until notified by tournament staff, Lincoln Douglas and Pelham Debates will only be able to enter/apply for TWO entries, and Public Forum will only be able to enter/apply for THREE entries. Please do not enter the names of more than 2 teams/competitors for Pelham and Lincoln Douglas and 3 teams for PF, as it creates a severe administrative burden on the tournament staff to sift through extra entries. If we are able to accept subsequent entries, we will let you know once initial admittance decisions are made. o We will once again have The Pelham Debates starting at 1:30 on Emory’s campus. You will be responsible for paying for your parking on Friday, since this is earlier than we are able to gain access to the parking decks. We will have three rounds on Friday, four on Saturday, and start with octos on Sunday morning. o You will not be allowed to enter prefs until all your judges have supplied a paradigm. o All rounds on Sunday will be held in the School of Medicine building in lieu of starting the day in White Hall. o Due to room constraints caused by construction, at least until December 7th or until notified by tournament staff, please do not enter/apply for more than 2 teams for the Pelham Debates. 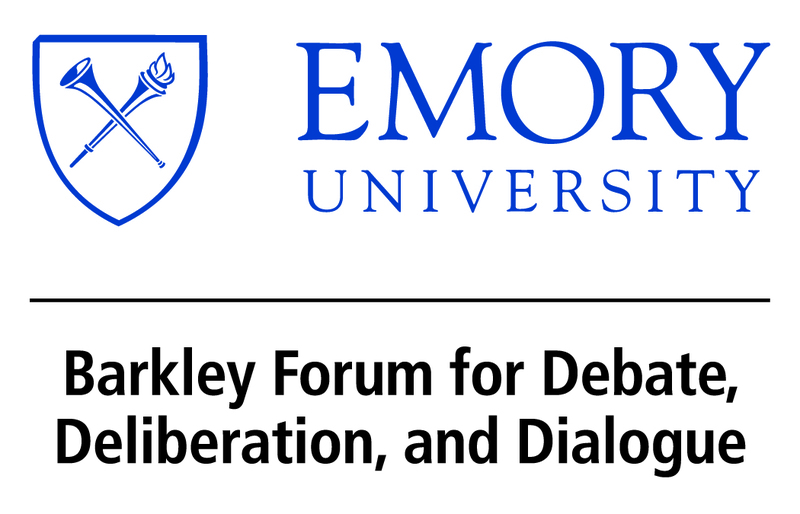 o After the 2018 tournament, we surveyed those with participants in Public Forum to see if they would prefer to remain on the Emory campus with a firm 2-team cap or if they would prefer we hold Public Forum at Druid Hills High School, which is adjacent to the Emory campus, and allow schools the possibility of bringing up to four teams. The overwhelming preference was to be at Druid Hills, so the Public Forum division will be held at Druid Hills High School on Friday and Saturday and will be on the Emory campus on Sunday. As a result, Member Schools will be guaranteed three teams and can apply for a fourth. Non-member schools can apply for three teams initially and a fourth after the initial round of admittance decisions are made. o We will again offer partial triples and plan to clear all 4-2 or better teams. o The Exhibition (final round) on Sunday will be held in White Hall. o At least until December 7th or until notified by tournament staff, please do not enter/apply for more than 3 teams for Public Forum. o Due to room constraints caused by construction, at least until December 7th or until notified by tournament staff, please do not enter/apply for more than 2 entries for Lincoln Douglas. o We will use electronic ballots in Congressional Debate; please make sure all judges have access to a laptop or iPad on which they can enter comments. o As a pilot for the NSDA, the Barkley Forum will limit debate on any bill or resolution to no more than one hour. o In lieu of the Prose and Poetry event we have traditionally offered, we will offer Program Oral Interpretation. o We will be adding Informative Speaking to our competitive offerings. o We would again like to showcase the final round of a speech event and highlight it in a way similar to what we have done for the Pelham Debates since the inception of the tournament. This year, the finals of Program Oral Interpretation will be held at the same time as the finals for the Pelham Debates, with Key Coaches adjudicating both events. After the final rounds, awards for all events will be held simultaneously in the WHSCAB auditorium. · Please note that Emory is a tobacco-free campus. For more information, please visit www.tobaccofree.emory.edu. · We will be using tabroom.com for all divisions. We require that all judges have an established, functional Tabroom account prior to being registered as a judge. If there are any questions about this requirement, please feel free to let us know. · For use while you are on campus, consider downloading Emory Mobile. Under “Campus Connection,” there are maps, and there are also instructions for getting your wireless devices connected to WiFi, dining information, etc. · We will give doubles awards in all debate events following rounds on Saturday night (after the First Tutorial in Public Forum, the Walter Alan Ulrich Tutorial in LD, and the Anne Douglas White Tutorial in Pelham), the semifinals awards in Congressional Debate on Sunday morning, and the quarterfinals awards (tutorials participants) in speech events on Sunday morning. · If students qualify to participate in the tutorials (i.e., clear), they are expected to be available through the final exhibition round to respect their opponents and the participants who will learn from their performance. If a student must leave the tournament and cannot participate in a tutorial or exhibition round for which s/he has qualified, s/he will forfeit his/her award and all rounds after preliminary rounds. Special circumstances may lead to rare exceptions to this rule at the tournament director’s discretion. We are providing this information so you may make your travel plans accordingly. · We will have a judges’ lounge with coffee. · It is an expectation of the tournament that students will accurately represent material read during speeches. In order to ensure compliance, students may record their opponents’ speeches. It is the responsibility of coaches to ensure that their debaters and parents understand this tournament requirement and complete the paperwork necessary to ensure compliance with applicable state laws. · Please ensure your judges show up, particularly on Sunday. For judges that do not show, we will assess a $50 per round fine to be added to your 2020 entry fee. In addition, it will endanger any Member Schools’ standing. · Mavericks in 2-team events cannot clear; they must have debated as a team collectively for at least 4 rounds. In Pelham Debates, each debater has to give a constructive and a rebuttal to have considered debating in a round; if both debaters have not done so during a round, they cannot advance. Applications to attend (including the competitive records/qualifiers for each student applying) from non-member schools must be entered on the BFHS website no later than December 3, 2018. Indications of attendance from member schools must be entered on the website by the same date. Shortly thereafter, an email will be sent to all the schools that have been selected to attend. In order to launch the tournament appropriately and celebrate the 64th anniversary of the tournament, we will have an Opening Awards Assembly for all students, coaches, and judges from 11:00 a.m.-12:00 p.m. on Friday, January 25th in the ballroom of the Marriott Century Center during which participants will hear a keynote speaker, recognize the new Key coaches, and honor the winner of the Melissa Maxcy Wade Social Justice Award. We are honored that Glenda Ferguson, Key Coach and retired speech and debate coach and teacher from Coppell High School, will be our keynote speaker this year. Also, Mr. Jeff Graham, Executive Director of Georgia Equality, will receive the Georgia Speaker of the Year Award. We anticipate that pairings will be available at the end of the Opening Awards Assembly. Please note that students’ participation in the Barkley Forum for High Schools constitutes consent to use their image in promotional materials for the tournament/Barkley Forum. In Public Forum Debate, we are accepting three entries from Member Schools. We will accept three applications from non-member schools, and admission will be granted based upon space available. After the first round of admittance decisions are made, we might be able to let in fourth teams and will communicate that with you if space constraints make that possible. Please only enter THREE teams on Tabroom prior to December 3, 2018. Teams will get three judge strikes. In Congressional Debate, we are accepting ten entries from Member Schools. We will accept ten applications from non-member schools, and admission will be granted based upon the space available. The Pelham Debates feature two-person, switch-sides debating using the cross-examination format. Member schools will send their most experienced teams since the FORUM IS NOT A PRACTICE-TYPE TOURNAMENT. This year we are accepting two entries from Member Schools. We will accept two applications from non-member schools, and admission will be granted based upon space available. After the first round of admittance decisions are made, we might be able to let in third teams and will communicate that with you if space constraints make that possible. Please only enter TWO teams on Tabroom prior to December 3, 2018. There will be six preliminary rounds of debate. The top 32 teams will be asked to participate in five exhibition rounds. We will have a mutual judge preference system for the Pelham Debates (using an ordinal ranking system), so it is especially important that your judges are entered accurately in a timely fashion. If your judges are not entered by the time prefs go up, you will be required to pay the full judge hire fee. Please have all judges post his or her judge philosophy on tabroom.com under “paradigms.” You will not be allowed to enter prefs until all your judges have supplied a paradigm. More details about prefs will follow via email closer to the tournament date. Please note that the judge preferences do not apply to The Thomas Glenn Pelham Silver Key Debate. In Lincoln-Douglas, we are accepting two entries from Member Schools. We will accept two applications from non-member schools, and admission will be granted based upon space available. After the first round of admittance decisions are made, we might be able to let in third entries and will communicate that with you if space constraints make that possible. Please only enter TWO competitors on Tabroom prior to December 3, 2018. Up to the top 32 individuals (with a 4-2 record or better) will be asked to participate in the exhibition rounds. We will have a mutual judge preference system for the Lincoln-Douglas Debates, so it is especially important that your judges are entered accurately in a timely fashion. If your judges are not entered by the time prefs go up, you will be required to pay the full judge hire fee. Please have all judges post his or her judge philosophy on tabroom.com under “paradigms.” You will not be allowed to enter prefs until all your judges have supplied a paradigm. More details about prefs will follow via email closer to the tournament date. Please note that the judge preferences do not apply to The Dale Lauder McCall Exhibition. In Speech Events, four entries per school are permitted in any one event. No triple entries will be allowed. The Final Awards Ceremony will be held in the Woodruff Health Sciences Center Administration Building (WHSCAB). You will not want to miss the Presentation of the Silver Keys and supportive awards, as it is nationally unique. If there are any last-minute changes, please notify us in writing at EmoryBFHS@gmail.com. During the course of the tournament, we will be posting updates on Tabroom. We hope to bring you the best possible forensics experience we can offer. May we hear from each of you soon.